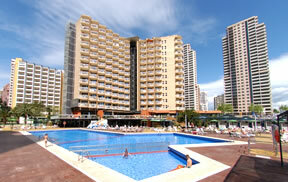 Centrally located in Benidorm, Medplaya Rio Park is just a short walk from the coastline, and is the ideal place for a family holiday in the sunshine. Equipped with an outdoor swimming pool, you can spend the day relaxing, sunbathing and taking refreshing dips in the cool waters. Each of the bedrooms in Medplaya Rio Park is practical, spacious and well equipped, including air conditioning, so you can enjoy a typical Spanish siesta. Wired internet is available in public areas and costs EUR 6.00 per hour.